Kidneys are organs that filter wastes and toxins out of the blood and keep it balanced. Most people have two kidneys, but some people function well with only one. They are the size of a fist and occupy a space near the middle of the back below the rib cage. Blood is continually processed through the kidneys to filter out waste. They produce about 2 quarts of waste and water. That liquid is urine which is deposited into your bladder. When your bladder is full, you urinate, getting rid of it. Diabetes is a disease in which insulin is either not produced (type 1) or insulin made by the pancreas is no longer effective (type 2). Glucose enters the blood stream as food is digested. Insulin is a hormone that allows glucose to leave the blood as it circulates and enter the cells. When glucose enters the cells, it fuels them, with the energy they need to run the body. If there is no insulin, or if it is not working like it should, the glucose keeps circulating in the blood, unable to leave. Complications of prolonged excess blood glucose can affect small blood vessels throughout the body, not only the kidneys, but also nerves and muscles, eyes and the heart. Neuropathy, retinopathy, and cardiovascular disease are all complications that affect these organs. Good control of blood glucose levels helps reduce or prevent these complications. Checking blood sugar several times a day is a good way to achieve this kind of control. Kidneys are made up of millions of tiny filters called nephrons. The nephrons have even smaller vessels within them. These are destroyed over time when glucose levels are consistently too high. This affects the kidneys ability to filter the blood. Waste that would ordinarily be excreted remains in the blood causing severe problems. Usually, damage takes years to develop. High blood pressure can be an indication that the kidney function is deteriorating. Paradoxically, high blood pressure can also hasten kidney damage. Blood pressure medications are usually prescribed to keep blood pressure at an acceptable level and also to slow the progression of damage. Usually, a combination of medications are used to keep blood pressure normal. ACE (angiotensin-converting enzyme) inhibitors and ARBs (angiotensin receptor blockers) are the most commonly prescribed drugs. Creatinine is a waste product that is normally filtered from the blood and excreted in the urine. When kidneys start to fail, creatinine builds up in the blood. Doctors watch the creatinine levels carefully to determine how much function the kidneys have. A normal level is usually between 0.6 and 1.2 mg/dl. This does vary slightly. As the number increases above 1.2, it shows that kidney function is decreasing. Creatinine levels are obtained by a simple blood test. BUN (blood urea nitrogen) is another marker of kidney function that doctors look at. When blood flows through the body, protein circulates to cells. Cells use the protein and throw away the waste that they don't need. This waste is called urea. Normally urea is filtered out of the blood by the kidneys. Urea also contains nitrogen. If the kidneys aren't working like they should, urea and nitrogen stay in the blood. A BUN of over 20 mg/dl is an indicator of decreased kidney function. Kidney failure is the last stage of kidney disease. When kidneys can longer function, no toxins or waste products can be eliminated from the body. All those waste products continue to circulate in the blood, causing it to become extremely toxic. When someone's kidneys have failed, it is known as end-stage renal disease (ESRD). No one can live very long with ESRD without intervention. Either dialysis or a transplant is needed. Hemodialysis is performed at a dialysis center 3 times a week by qualified personnel. The process takes 3-4 hours and over the course of that time, a patient's blood is sent through a machine which filters it and gives it back. A permanent shunt is surgically implanted in a vein for access. Peritoneal dialysis can be performed at home by the patient. It requires a high level of commitment because it must be done every day. Both kinds of dialysis help prolong life. Sometimes, a donated kidney can be transplanted into the body. 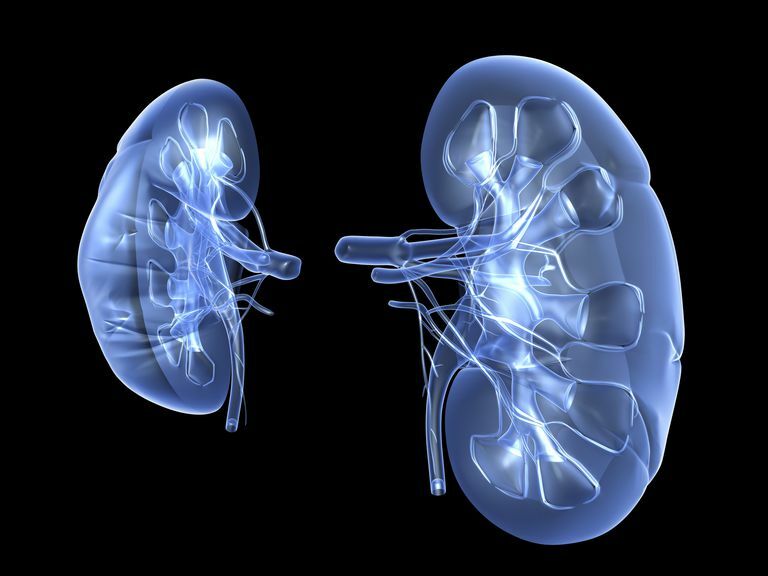 The new kidney would take over the renal function for the two nonfunctioning kidneys. The transplanted kidney should match the tissue type of the person receiving the kidney, as closely as possible. After the transplant, immunosuppresant drugs must be taken for life, to prevent the rejection of the organ. Because kidney disease can take years to develop, people with diabetes can do many things to lower the risk. Tight control of blood glucose levels can prevent or reduce long-term damage to the fragile blood vessels not only in the kidneys but elsewhere in the body. Check blood pressure often, and try to keep it at or under 130/85. Take an ACE or ARB if your doctor prescribes it. Watch your cholesterol and your weight. Quit smoking. All these things can go a long way towards keeping your kidneys working well for as long as possible.